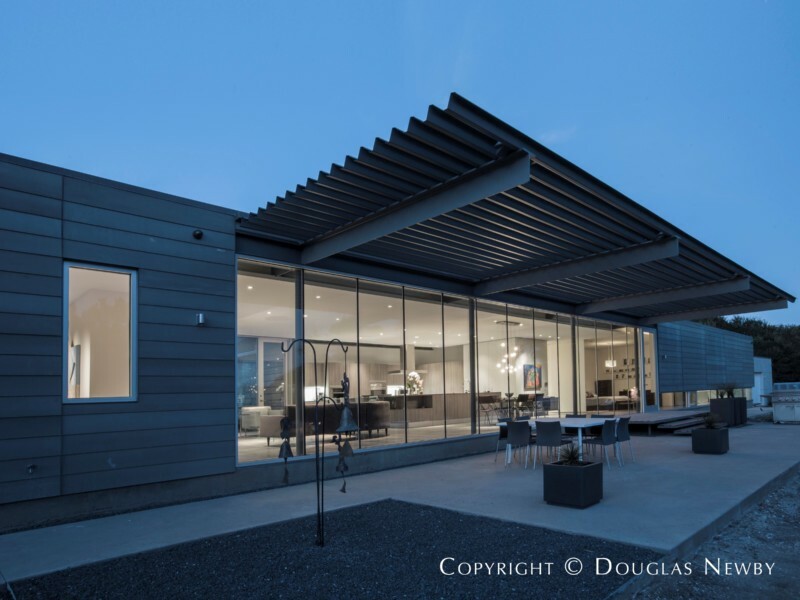 Joshua Nimmo designed an architecturally significant modern home that furthers the evolution of good design. This home also clarifies and amplifies the vision of Urban Reserve, an enclave of modern homes in an ecologically and aesthetically enlightened neighborhood. 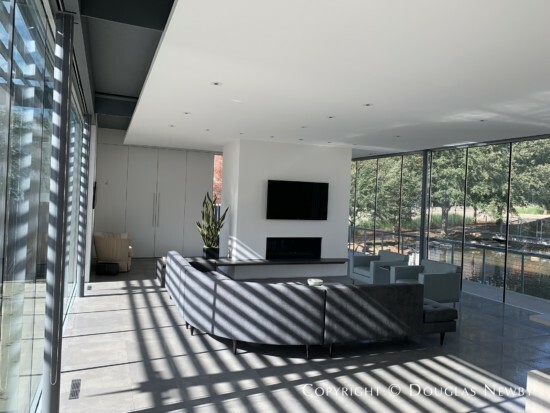 Glass walls allow view of the pond from inside of house and glass walls from exterior porches on both sides of this modern home. Architect Joshua Nimmo responds to the ecologically sensitive environment of Urban Reserve, capturing its beauty, serenity, and dynamic architectural modern backdrop. When you approach the home at 26 Vanguard Way, you know Urban Reserve is a success. Have you ever entered a home that took your breath away, but you did not know why? 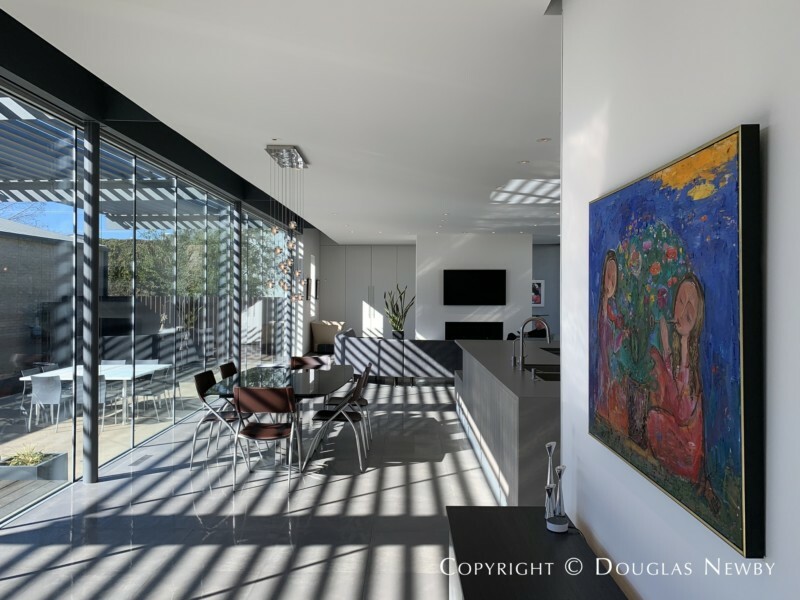 In the primary living space of this modern home you can see how Joshua Nimmo displays powerful strokes to create a sublime space. Many architects exaggerate the modern architectural elements of the home that quickly become architectural ornamentation. Rather than bring attention to modern architectural adornment, Joshua Nimmo allows the pleasing effects of his design to subliminally permeate the home. The finesse of his architectural notes is deep and complex yet the home seems so simple. Architect Joshua Nimmo’s design appeals to all the senses. Here is a modern home that simultaneously raises your adrenaline and lowers your blood pressure. It is fun to explore and think about the space to discover and understand how Joshua Nimmo accomplishes this. 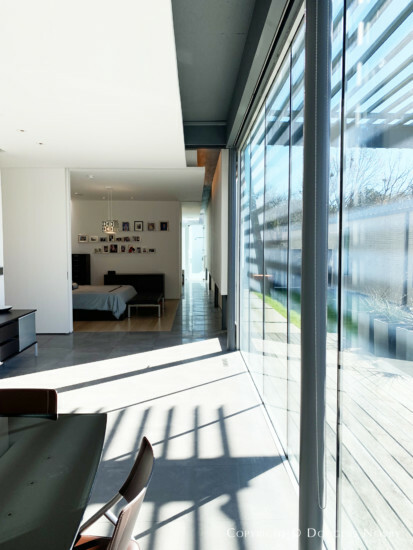 Many modern homes have an abundance of glass to identify it as modern. In this modern design the glass is purposeful and inspired. Flanking walls of 9 ½-foot-high frameless glass panels provide fabulous north views of the duck pond and south views to the porch, trellis and garden. Even more inspiring is the interplay of light—patterns of sunlight and shadows, diffused light, reflected light, warm light, bright light, light streaming across the room, softly illuminating light from long interior light shafts, bands of warm sunlight from clerestory windows accentuating the room, and sunlight bouncing off the floor and ceiling. The palette of gray and white surfaces takes on rich tones in a medley of this changing light. North sunlight softly illuminates and the low winter sun streaks brightly across the space. 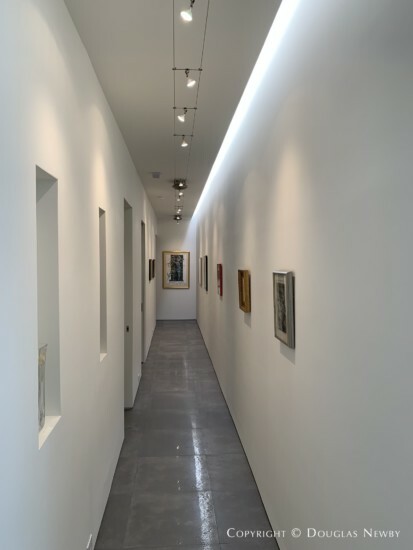 GrafikEye lutron lighting designed by two noted lighting designers add to the natural light. An East Coast lighting designer calibrated the lighting, specing every bulb and a Dallas lighting designer designed the art lighting. From anywhere inside these open rooms you will be able to see sunlight in all four directions. 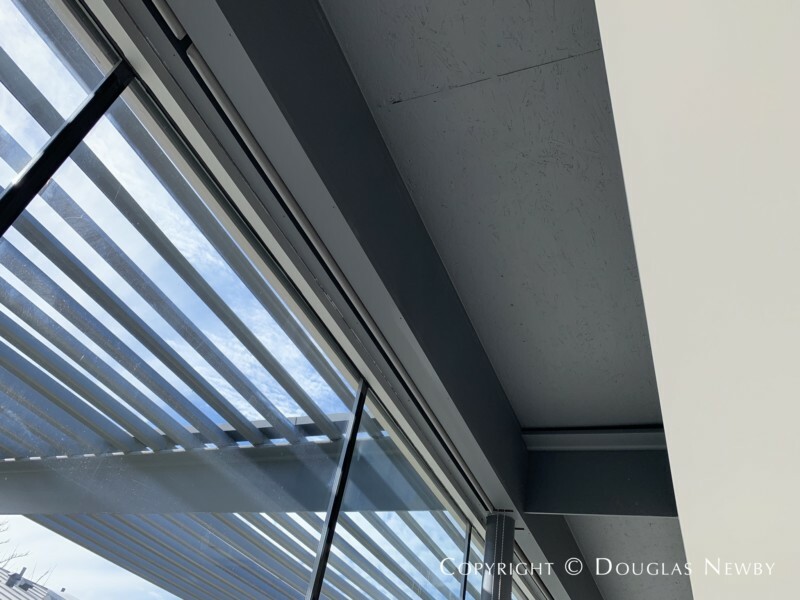 Further enhancing this sense of joy is that from every room you will be able to see into seven minimally defined indoor or outdoor rooms. 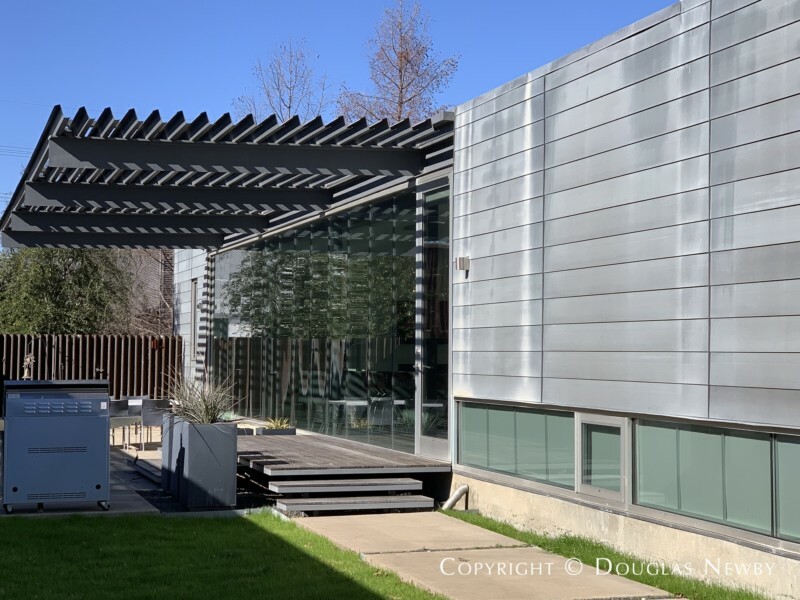 Jim Wiley and Bud Oglesby designed for chamber musician Dorothea Kelley a modern home in which the sliding doors on the surrounding bedrooms opened up and served as seating for the concert below. Here a wide sliding door can be opened to also expand the interior space for a concert or a party. The seasonal range of desirable weather in Dallas is often under-appreciated. The early morning temperatures into early July can dip into the 60ºs. An important part of Texas Modern architecture is orienting the home to accommodate the environment, Porches capturing breezes and shielding the sun have been a long-honored tradition from the early pioneer homes that inspired the original Texas Modern architect David Williams and architect O’Neil Ford. Christmas Day might bring snow or temperatures that reach the 70ºs. 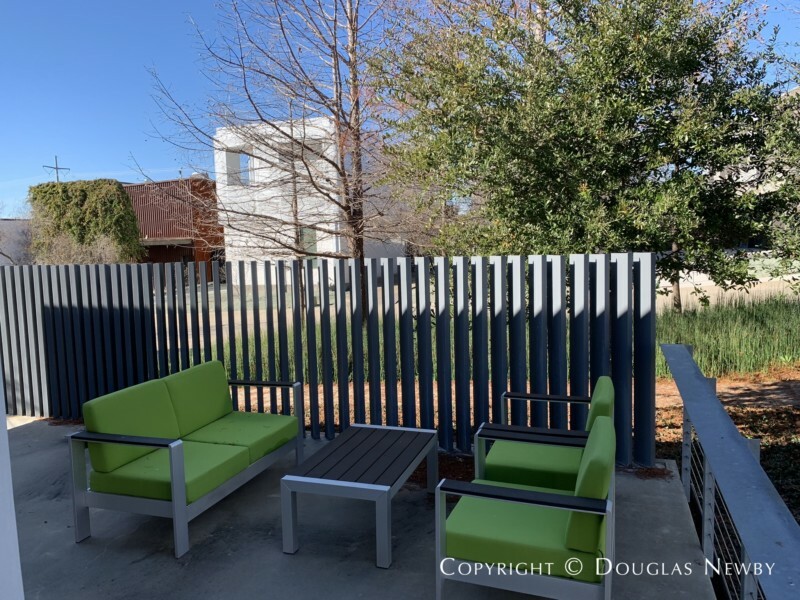 Architect Joshua Nimmo designed this home so you will be able to enjoy the soft sunlight in the summer on the north side of the home as you overlook the duck pond, and the southeastern breezes are captured under the trellis that shades the sun in the summer. In the winter the angle of the trellis allows the warm, bright, low winter sun to shine through the trellis by the south garden to animate the interior of the home with sunlight. Both of these porches extend the interior of the home visually and for everyday living. Modern homes are seldom associated with front porch neighborhoods. 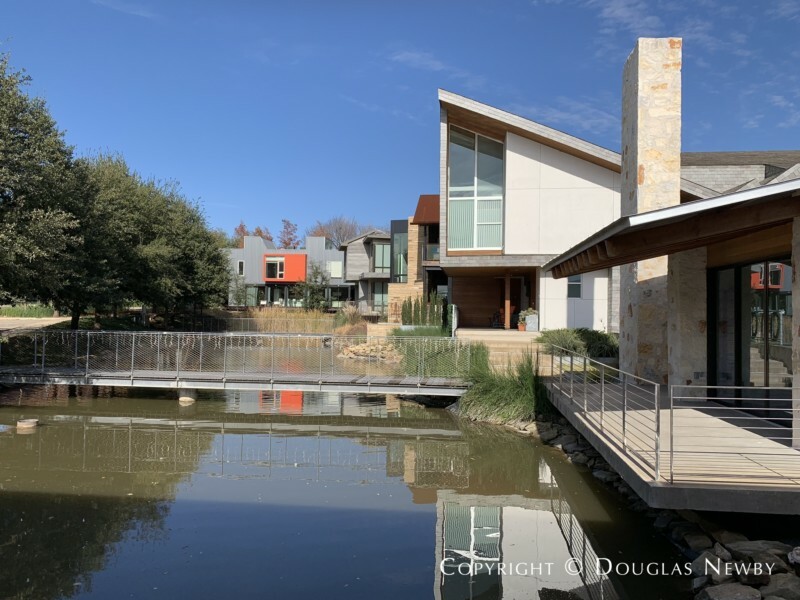 Here the owners on the quiet protected street of Urban Reserve are spontaneously joined by their neighbors when they sit on their front porch cantilevered over the pond. Dallas doesn’t have mountains on the horizon, but views from this modern home are peaceful and dynamic. 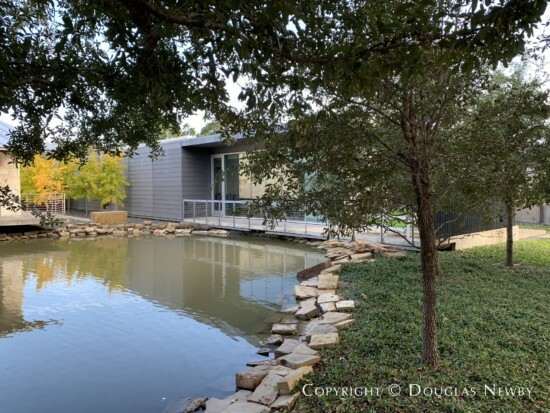 Looking over the duck pond you will enjoy the visual interests of the architectural composition of modern homes that form the visual backdrop. How many neighborhoods have the privacy for an outdoor shower? 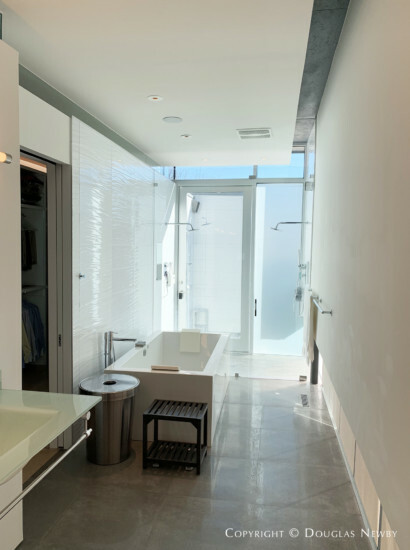 In this modern home the outdoor shower is connected to the master bathroom, however it is outside, private and secluded. People gravitate to a kitchen as it is a center of activity and personifies the energy of a home. In this modern home the kitchen is in the center of the home, but the architectural pull of this kitchen makes the attraction even stronger. The depth of gray tones of the Porcelanosa kitchen cabinets and the Neolith composite concrete countertops provide a stylish complement to the two-foot square gray concrete tile floors and subtly gray-stained hardwood floors. This palette of soft grays is illuminated by the contrasting density of incoming sunlight that people love and are attracted to. The aesthetics of the kitchen feels like a living room, but on closer look will reveal the culinary sophistication. 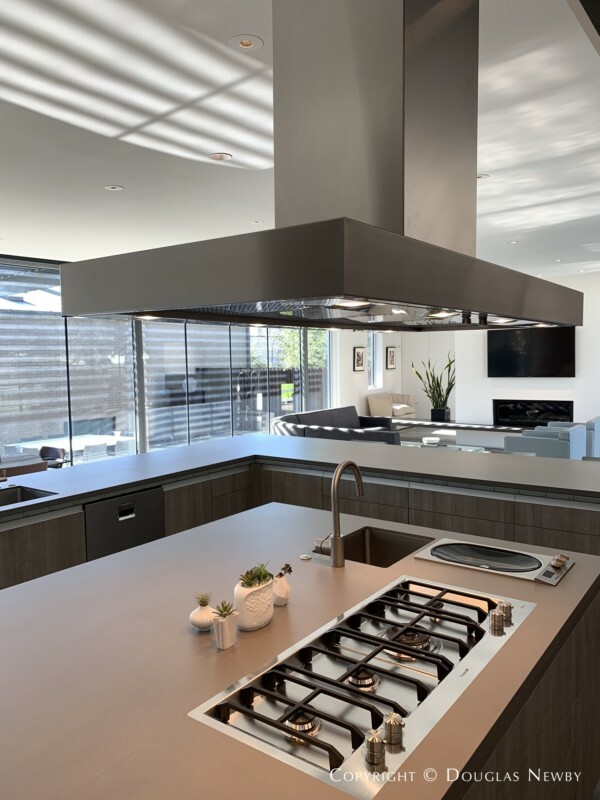 The Italian made cooktop is by Foster from Italy, the countertop steamer/boiler is from Gaggenau, the microwave, warming drawer and double convection ovens are by Wolf and the refrigerator and freezer are Sub-Zero. 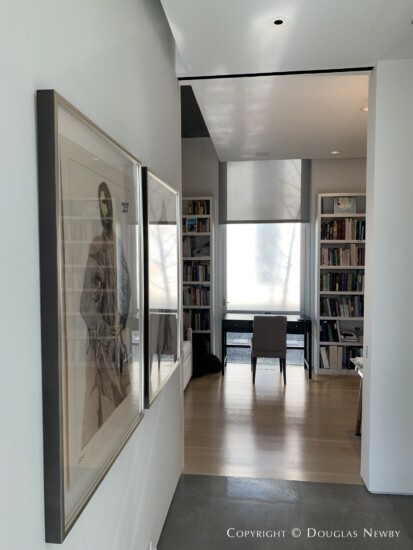 Subtle details like the art gallery wall finishes, the narrow reveal that lifts the walls off the floor, and the two-foot ceiling exposure of the steel beams that blend the ceiling into the skyline and continue into the trellis structure provide further visual delight. With just over 3,000 square feet, this home lives much larger than most 4,000 or 5,000 square foot homes. Each space is used for multiple purposes and extends to the exterior living spaces with ease. The interior is refined; the structure is stout. Twenty deep piers down to rock support the house. A double system of French drains and sump pump along with an automatic exhaust fan keep the pier and beam foundation dry. This modern home designed by architect Joshua Nimmo is a triumph aesthetically and structurally. To find out more about this architecturally significant home in Urban Reserve, please contact Douglas Newby.